For anyone with a dream of sun-drenched fun, Mexico's beaches are no longer just for the well-to-do. Today, resorts on the country's Pacific and Caribbean coasts offer something for every taste, and budget. What's more, most Americans can make the trip to Mexico in little more than a two-hour flight. So, before making plans for an adventure south of the border, read on for Travel Channel's list of the Top 10 Mexican Beach Resorts. Located in the "corridor" between the towns of Cabo San Lucas and San Jose del Cabo, this resort is the largest beach retreat in Los Cabos, with more than 300 rooms and one of the largest hotel pools in Mexico. However, many travelers are attracted to the Melia's greens, not its deep blue. Nearby, the "El Dorado" and the "Cabo Real," designed by Jack Nicklaus and Robert Trent Jones, respectively, offer professional-grade links, as well as phenomenal views of the Pacific Ocean.Curves are what seem to define the Westin Regina - from the enormous, shapely, terracotta building to the undulating shapes of its seven pools. When building this resort, designers tried to follow the natural contours of the coastline, creating a getaway that is in tune with land and the ocean. Guest rooms also received a local touch, and are decorated in traditional bright colors and accented with Mexican handicrafts. Not surprisingly, activities at the Westin Regina reflect a "back to nature" ethos, with swimming, snorkeling and horseback riding the most popular distractions. Mexico's southwest coast is home to the Camino Real Las Hadas, a resort whose beach was made famous by Bo Derek in the film 10. Luckily, Hollywood didn't spoil this magical stretch of shore, enabling Las Hadas to retain its romantic, tropical charm. Moorish-style white stucco architecture and palm-fringed walkways make Las Hadas a tropical paradise, while its private beach and marina add an understated elegance. All the guest rooms have terraces, and each of the five suites has a private plunge pool. Most spectacular is the Minaret Suite, which has unmatched views of the Mexican Riviera. Awarded the coveted AAA five-diamond rating seven years in a row, the Fiesta Americana Grand Coral Beach is tops in terms of service and accommodations. Even though it's just a stroll from the non-stop entertainment along Cancun's strip, the Fiesta Americana offers its own exhaustive roster of activities, including swimming, snorkeling and jet skiing. Guests who prefer to take it easy can enjoy ocean views from any of the resort's 602 rooms, or enjoy a gourmet meal at La Joya, the first restaurant in Cancun to score a five-diamond rating from AAA. Acapulco is known for its cliff divers, its swank high rises and the Acapulco Princess. This 1,019-room mega-resort, designed to resemble an Aztec temple, lays claim to seven restaurants, seven bars, seven tennis courts, five pools, an 18-hole golf course, a shopping arcade and a recently inaugurated fitness center. Despite the grand surroundings, however, guest rooms are intimate. Tropical foliage, cane furniture, tasteful decor in muted tones of green and beige and private terraces with views of the Sierra Madre mountains or the Pacific Ocean create a peaceful atmosphere amid the hustle and bustle of the resort. Carved out of a coconut plantation, the Westin Regina Puerto Vallarta is a lush paradise. From the guest rooms, which are decorated in vivid mosaics, to the 600 coconut palms clustered on the resort's 21 acres, the Westin Regina oozes Mexico. The resort is one of the newest in Puerto Vallarta, but it maintains a classic charm. Golfing, boating, deep-sea fishing and scuba diving are just a few of the activities available. With only 31 suites and 25 guest rooms, the Casa Del Mar Golf Resort & Spa proves that less is definitely more. Travelers wishing to escape the crowds, but still enjoy a tropical-resort atmosphere, will revel in the relative calm found in the Casa del Mar's six pools, verdant gardens and first-class beauty salon and spa. And, unlike larger resorts, Casa del Mar boasts two staff members per guest, ensuring that each patron receives superb service. Other luxuries include the Robert Trent Jones golf course, on-site tennis courts and private beach access. Surrounded by the jungle, the mountains and the sea, La Jolla makes the most of its natural environment. Adventurous travelers can take part in the resort's many organized excursions, including mountain biking, kayaking, snorkeling, horseback riding and deep-sea fishing. On the premises, guests can take a dip in one of La Jolla's three pools, play tennis, shop or relax with a spa treatment. Families are also catered to at La Jolla de Mismaloya, as evidenced by a myriad of activities suitable for kids and adults. Travelers can expect exquisite cuisine, elegant decor and a Mediterranean-style flair at the French-run Le Meridien Resort & Spa. Like its Cancun neighbors, Le Meridien offers guests the opportunity to swim in cascading pools, play a round of golf at area courses or laze around on sugary beaches. But it's Le Meridien's Spa del Mar that keeps guests coming back. Just about every treatment and facility is available at the resort's 15,000-square foot spa, including hydrotherapy, massage, facials, Swiss showers, cold plunge pools and steam rooms. Situated on its own island between the Laguna Navidad and the Pacific Ocean, the Isla Navidad offers the best of both worlds. On the one hand, the resort is completely secluded and self-contained, making for an utterly romantic atmosphere. 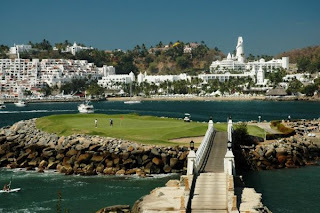 On the other, Isla Navidad boasts luxurious facilities, including a country club with a 27-hole, championship-par golf course, a yacht marina, three pools, tennis courts and two restaurants. To top it all off, the resort has at least 200 brands of tequila and an in-house master cigar maker, in case travelers feel the need to celebrate such a choice, tropical location. Love is in the air at the Royal Hideaway Playacar in the ever-popular Mayan Riviera. The resort is one of the few in the world to be honored with the AAA 5 Diamond Award, a testament to its phenomenal service (2.2 employees for every guest) and refined setting. During the day, guests feast on fresh guacamole and frozen cocktails alongside the cascading infinity pool. This snack is just a prelude to a gourmet meal at 1 of the 6 restaurants serving European, Asian, Italian and, of course, Mexican food. Mexican beach resorts is the beautiful place for spending your holidays. Yes, love the beaches so much.